A free sample from chapter 2 Accounting Fundamentals of our Landlord / Property Management in QuickBooks guide. We just finished posting our sample excerpts from all of chapter 2. Please take a look at them to get an idea about what content you can find in the full guide. We hope to see you as a customer soon, where you can instantly download everything, including sample company files. 2.01 Why Does a Landlord or Investor Need Accounting? 2.03 What is an Account? 2.04 What is The Chart of Accounts? 2.09 What is Double-Entry Accounting? 2.12 What are Capital Improvements versus Repairs? Order our full training today. It comes with a money back guarantee. And thousands of customers love it (read testimonials ♥). A free sample from chapter 2 Accounting Fundamentals of our Landlord / Property Management in QuickBooks guide. Section 2.13 Cash Accounting, not Accrual. We hope you’ll become a customer today, or sign up for the free e-course. Two methods exist in tracking income and expenses. Each can be recognized as they are earned/incurred (accrual method), or recognize them as they are actually deposited/paid (cash accounting). 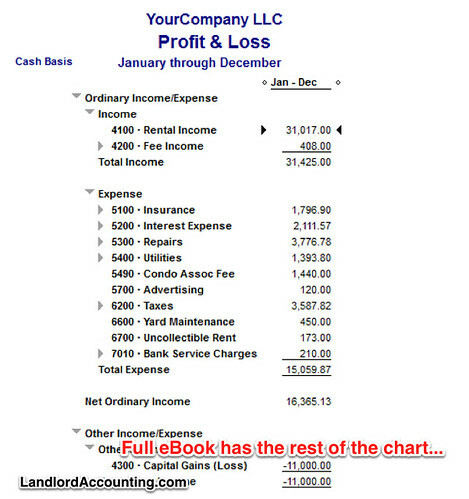 Cash accounting is used in this book. Accrual Accounting records financial events in the period they are incurred. Even if cash is not received or paid in a transaction, they are recorded because they are significant to the future income and cash flow of the company. If you record an income event on the day rent is due, and not when it is received, that is accrual accounting. Cash Accounting records financial events based on cash flow. Revenue is recognized when cash is received and expense is recognized when cash is paid. The distinctions appear if you incurred an expense (were billed) at the end of December, although did not pay until the 5th of January. Accrual accounting would recognize the expense and enter an accounts payable entry in the previous year but not reduce your cash and liability account until January. Cash accounting lumps those two transactions into one, reducing cash and recognizing the expense on January 5th. A free sample from chapter 2 Accounting Fundamentals of our Landlord / Property Management in QuickBooks guide. Section 2.12 What are Capital Improvements versus Repairs? We hope you’ll become a customer today, or sign up for the free e-course. Caution: Have a conversation with your accountant about what he or she wants you to capitalize and what to expense. This is a grey area due to court rulings in which owners expensed some things (and got away with it) the IRS suggests one capitalize. Do your own homework and talk to your accountant. Routine maintenance and repairs are not treated the same as capital improvements. This becomes very important when you enter the transactions into QuickBooks. Repairs go into QuickBooks one way (as expenses), while capital improvements go in another way (as increases to the value of your real estate assets). The following definitions are from IRS publication 527. Repairs keep your property in good operating condition. They do not materially add to the value of your property or substantially prolong its life. Repainting your property inside or out, fixing gutters or floors, fixing leaks, plastering, and replacing broken windows are examples of repairs. If you make repairs as part of an extensive remodeling or restoration of your property, the whole job is an improvement. For instance, in a large rehab project if you repaint the walls (typically this is a repair) it is an improvement. Capital Improvements add to the value of property, prolong its useful life, or adapt it to new uses. If you make an improvement to property, the cost of the improvement must be capitalized. The capitalized cost can generally be depreciated as if the improvement were separate property. The following Frequently Asked Questions are taken from the IRS’ website. The questions were current at time of publication. I suggest you ask the same questions to your accountant. It will help you learn how aggressive he or she is. Replacements of roof, rain gutters, windows, and furnace on a residential rental property are capital improvements to the structure because they materially add to the value of your property or substantially prolong its life. The items would be in the same class of property as the rental property to which they are attached. Since the property is residential rental property, the items are generally depreciated over a recovery period of 27.5 years using the straight line method of depreciation and a mid-month convention. Repairs, such as repainting the residential rental property, are currently deductible expenses. A repair keeps your property in good operating condition. It does not materially add to the value of your property or substantially prolong its life. Repainting your property inside or out, fixing gutters or floors, fixing leaks, plastering, and replacing broken windows are examples of repairs. If you make repairs as part of an extensive remodeling or restoration of your property, the whole job is an improvement. In that case, you should capitalize and depreciate the repair costs as the same class of property that you have restored or remodeled as discussed above. For more information, refer to IRS Publication 527, Residential Rental Property and IRS Publication 946, How to Depreciate Property. A free sample from chapter 2 Accounting Fundamentals of our Landlord / Property Management in QuickBooks guide. Section 2.11 What is Depreciation? We hope you’ll become a customer today, or sign up for the free e-course. We discuss this in another article as well about depreciation vs expenses. If you have purchased a new car before, you already have experienced depreciation. As soon as that brand new car is driven off the lot, it loses significant value (it depreciates). As you continue to drive it, time and wear and tear continue to decrease the car’s value. The value of an older car is less than a new car because of depreciation. For real estate, depreciation is a little different. First of all an older property will likely be worth more now than it was when it was first purchased because of the appreciation of property values. Appreciation is uncertain, though and not realized until you sell. Depreciation, for our purposes, is a tax issue. Depreciation is an annual income tax deduction that allows you to recover the cost or other basis of certain property over the time you use the property. It is an allowance for the wear and tear, deterioration, or obsolescence of the property. Straight Line Depreciation uses a constant amount to depreciate every year for the useful life. It is equal to the adjusted basis minus salvage value, divided by the useful life. The yearly depreciation could change if the useful life decreased or substantial investments were made in the asset to increase its adjusted basis. See Also: IRS publications 946 regarding depreciation of real property and 527 regarding Residential Rental Property. A free sample from chapter 2 Accounting Fundamentals of our Landlord / Property Management in QuickBooks guide. Section 2.10 Cost Basis and Adjusted Basis of Property. We hope you’ll become a customer today, or sign up for the free e-course. The adjusted basis is the current value of a property for tax purposes. It includes money you initially invested (the cost basis) as well as recent capital improvements to add value in a property (such as a new roof) minus depreciation every year. For an explanation of depreciation, see the next section. The adjusted basis does not include money you spend for routine repairs or maintenance. Basis (Cost Basis) is the cost (including cash paid, debt obligations, other property or services traded, etc.) to bring a property up to the initial condition necessary for renting (i.e. rehabbing, carpet and paint). This is your starting reference number for the tax value of a property. Adjusted Basis is the measure of your investment including additions or permanent improvements that increase the value of the property. (Depreciation deductions decrease the adjusted basis). Caution: Remember this book is not a replacement for professional advice. Do not take any of this information as tax or legal advice. Consult with your own competent advisors. A free sample from chapter 2 Accounting Fundamentals of our Landlord / Property Management in QuickBooks guide. Section 2.09 What is Double-Entry Accounting? We hope you’ll become a customer today, or sign up for the free e-course. Also, for any single transaction, the sum of all debits equals the sum of all credits. Double Entry Accounting describes a business by a number of different accounts, each describing an aspect of the business in monetary terms. Every transaction has a dual effect in two of these accounts. For instance, buying property with cash increases fixed assets (by the property) but decreases available cash. Buying with a mortgage increases fixed assets (the property) but also increases liabilities (the mortgage). If you followed along with previous sections’ examples, you’ve already performed double-entry accounting. When you received a $500 loan ($500 credit to liabilities) and deposited $500 in your cash account ($500 debit to cash), you followed the principles of double-entry accounting. $500 in debits equaled $500 in credits. Look in the previous chapter when you earned $1000 for the sale of your tofu pizza recipe to Aunt Betty, see the figure “Aunt Betty 2: (corrected).” The transactions are repeated in the following table. Observe how there are two entries for each transaction. In this case, you increase or decrease the cash account and then recognize why that occurred. It was either earned revenue or a decrease in liabilities. To repeat: for each transaction, the sum of debits equals the sum of credits. For transaction (1) this is $1000 = $1000 and for (2) $500 = $500. In more complicated entries there could be multiple debits and credits for each transaction, but in the end… The full eBook has more content but this concludes the sample. A free sample from chapter 2 Accounting Fundamentals of our Landlord / Property Management in QuickBooks guide. Section 2.08 The Sum of all Debits = the Sum of all Credits. We hope you’ll become a customer today, or sign up for the free e-course. As we talked about in recent posts about debits and credits, the accounting equation, and T-Accounts, there are basic accounting rules that, once learned, make complicated transactions simple. The sum of all debits must equal the sum of all credits. For one transaction (ex a Journal Entry), or for all transactions ever entered. It always is true. If you have to enter a transaction that this book doesn’t have an example of, draw the T- Accounts and amounts involved. Try to figure out what to do, then talk to your accountant and confirm you have the correct method. The only time you use debits and credits is in Journal Entries, if the sum of all debits does not equal the sum of all credits, there is a mistake. Keep moving through these sections, even if you do not completely understand them. The examples that follow will get you ready to work with QuickBooks. If you are terribly confused, that’s okay, skip ahead to the next chapter. 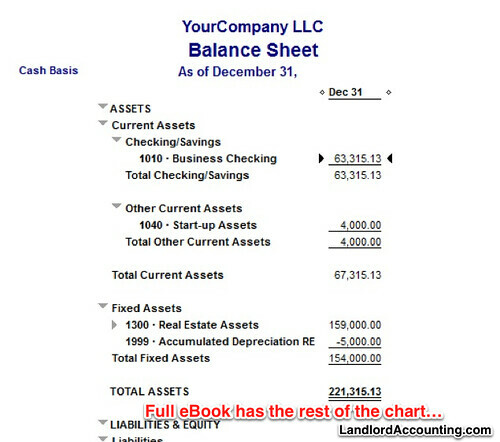 A free sample from chapter 2 Accounting Fundamentals of our Landlord Accounting in QuickBooks guide. Section 2.07 Introducing the Income (P & L) Statement. We hope you’ll become a customer today, or sign up for the free e-course. An Income (Profit and Loss) Statement records revenue and expenses over a specified period of time. It indicates how Net Revenue, also called the “top line,” (received from the sale of services before expenses are taken out) is transformed into Net Income, or the “bottom line,” (the result after all revenues and expenses have been accounted for). A free sample from chapter 2 Accounting Fundamentals of our Landlord / Property Management in QuickBooks guide. Section 2.06 Introducing the Balance Sheet. We hope you’ll become a customer today, or sign up for the free e-course. A Balance Sheet is a statement of the book value of a company at a particular date, usually at the end of its fiscal year. Think of it as a “snapshot” of the company’s financial condition on a given date. It answers how much the assets, liability and the equity are worth. The balance sheet has two parts: assets and liabilities. Assets of the company include money (“in hand” or owed to it), investments (including securities and real estate), and other property. The total assets are equal to the claims for payments (liabilities). This ends the excerpt, the actual eBook has more content. A free sample from chapter 2 Accounting Fundamentals of our Landlord Accounting in QuickBooks guide. Section 2.05 Debits and Credits? We hope you’ll become a customer today, or sign up for the free e-course. Does this seem too complicated or hard? “Debit” and “Credit” are two of the scariest words for many beginning bookkeepers. Debits occur on the left of a T-Account, and credits occur on the right. The frequent usage of Debit Cards and Credit Cards further confuses everyday language with accounting terminology. When you understand how to use Debits and Credits, they act as rules to guide you in figuring out almost any type of transaction. A Debit is always on the left hand side of a “T account.” Asset and Expense accounts increase in value when debited, whereas Liability, Equity, and Revenue accounts decrease in value when debited. The letters Dr. are the abbreviation for Debit. The opposite of a debit is a Credit. A Credit is always on the right hand side of a “T account.” Credit is abbreviated Cr. It is the opposite of a Debit. Debits are on the left and Credits are on the right. Increasing the balance in a cash account is a debit (it occurs on the left side of the T-Account.) Increasing the balance of a liability account is a credit. Turn the page back and look at the previous transactions, observing how they follow this rule. This section goes on for several more pages in the eBook, available for purchase and instant download. Q&A: How do I add late fees for rental properties that are different amounts? Jonathan Wolter on Tenants as Customers or Jobs in QuickBooks? Learn how to use QuickBooks for landlording with screenshots and examples. Unsubscribe easily. No spam, ever. Landlord Accounting: QuickBooks Easily Mastered for Property Managers, Investors, and Landlords. I do not provide accounting, legal, or tax advice. I only can share from my experience what has been helpful in understanding and using QuickBooks for rental properties. Always consult your own professionals regarding your specific situation.